The lion – Panthera Leoor ‘Simba’ to the Swahili – has to be one of the most charismatic and fascinating animals in the world – whether giving great roars, shaking that massive mane, playing with his cubs or fighting to keep his ladies safe – everyone loves to watch him! It symbolizes strength and can be regarded as a high-profile “celebrity” in the animal kingdom. Today, we bring you some of the most interesting lion facts that you may never have come across. 1 – Lions are one of the largest of the ‘big cats’ at approximately four-foot high, over seven-foot long and up to 500 lbs in weight. Most tend to be a tawny yellow-brown in colour all over, although black manes and tail tufts are not unusual. 2 – The great mane around a lion’s head is unique to the lion, and only appears on mature males – young males look rather scruffy as the mane starts to grow in! 3 – One genetic anomaly has produced a white African lion – not albinoism, but an actual gene that changes the body colour. 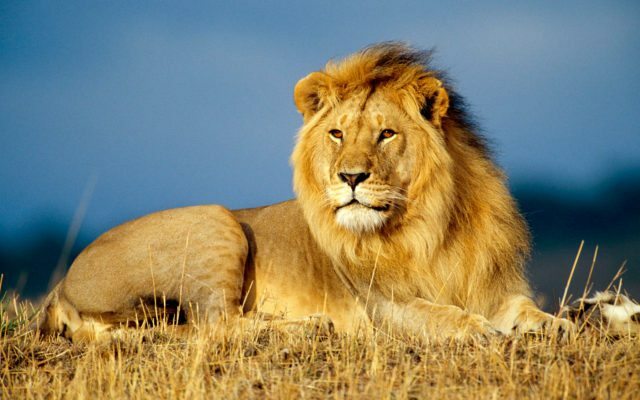 4 – Originally lions could be found throughout most of the warmer countries of the world, but now there are only two populations left, a few hundred Asiatic lions in Gir, India, and the remaining African lions in the sub-Saharan region of Africa. 5 – Unlike most big cats, lions are not usually solitary. They live in ‘prides’ that consist of several related lionesses and their cubs, some of which will be half-grown, and the two or three adult males, usually brothers or at least pride mates, who rule the territory and the pride. 6 – Only one species of big cat purrs, and it’s not the lion (that’s the cheetah). All the others roar instead, keeping in contact with family members or hunting companions with sounds that can be heard as much as five miles away. 7 – Lions are the laziest of the big cats, spending up to twenty hours a day sleeping in the shade, and the adult males are the laziest of them all, letting the lionesses do 90% of the pride’s hunting. 8 – Then, in return for ‘protecting’ the lionesses and patrolling the territory, these males take first go at the meat from the kills, which usually means the majority of it! 9 – Although lions can hunt at any time, they go after big preys, as a coordinated pack at night – and they are always successful about 50% of the time. 10 – Lions will kill anything, from mice and lizards for a quick snack, up to wildebeest or even young hippos and elephants, which will feed the whole pride for several meals. 11 – Scavenging can provide more than half their diet, as they will steal kills from less powerful predators whenever they get the chance. 12 – Lions are ‘obligate carnivores’, which means they can only really live on meat. They will drink from rivers, lakes etc if available, but can also survive on the moisture they get from their food for a while if necessary. 13 – If a lion wins the fight with another pride male and therefore takes over a new pride, often the first thing he does is kill any cub in this pride, in order to bring the lionesses back into heat. This removes the old male’s progeny and lets the new one start spreading his own genes all in one go. 14 – When a lioness comes into heat, a male will become her constant companion for the next few days – during which the two will mate (a very quick procedure!) every fifteen minutes or so, meaning they can mate a total of several hundred times over those few days! 15 – After a gestation period of 105 days, lionesses give birth to two or three cubs that weigh around 3 lbs each at birth. 16 – Some lionesses are great mothers, others lose interest very quickly, but since there are usually several litters at a time and the girls allow any cub to suckle, not just their own, the neglected ones can often survive anyway. 17 – Young lions are old enough to hunt effectively and look after themselves at about two years old; the females will usually stay with the pride, the males will leave when the mature pride males decide they are becoming a possible threat. 18 – After a few more years of growing and maturing, at around five or six years old these males then start challenging other pride males to try to win themselves the right to mate and pass on their genes. 19 – Average lifespan in the wild tends to be considerably less than the thirteen years a lion in captivity can expect to live, since there’s nothing trying to kill them in captivity! 20 – The only real predator of the lion is – man. Trophy hunts for the wall at home, tribal rituals of bravery or to show the kid has become a man, even just getting rid of the “vermin” that steal cattle, they used to be killed left, right and centre. Nowadays lions are protected by law in most places they’re found, but those that kill stock will still fall afoul of the stock’s owners. However, hopefully, a combination of persuading the lions to hunt wild prey instead of the easy domesticated ones and getting information to the people to tell them why they should not just kill these animals, is slowly taking effect. Keep your fingers crossed it continues that way and these magnificent creatures can be saved to roar for many more years to come.